Ophthalmic Clinical Officer, Mbingo Baptist Hospital Eye Department, Cameroon. Email: MBHCameroon@aol.com. Here, the majority of the people are farmers. In 2004, 31 patients with ocular injuries were seen in Mbingo Baptist Hospital Eye Department. As of November 2005, 17 patients have been seen. Injuries to the lids are not included. Causes of these injuries include tree branches and leaves, lacerations from knives and cutlasses, pellets from locally made guns used during traditional ceremonies, stone fragments injuring the eye when cracking stones without wearing protective spectacles, sticks and stones when children play. The majority of people live far away from an eye hospital. Some villages require eight hours of trekking to reach a motorable road to the hospital. The visual prognosis after management of an ocular injury will not only depend on the extent and location of the injury, but also on what happens during transportation to the hospital. The majority of our roads are rough, untarred and dusty. These expose the eye, especially an open injury, to further trauma and foreign bodies. Further injury to the eye during referral could be reduced by the use of an eye shield. 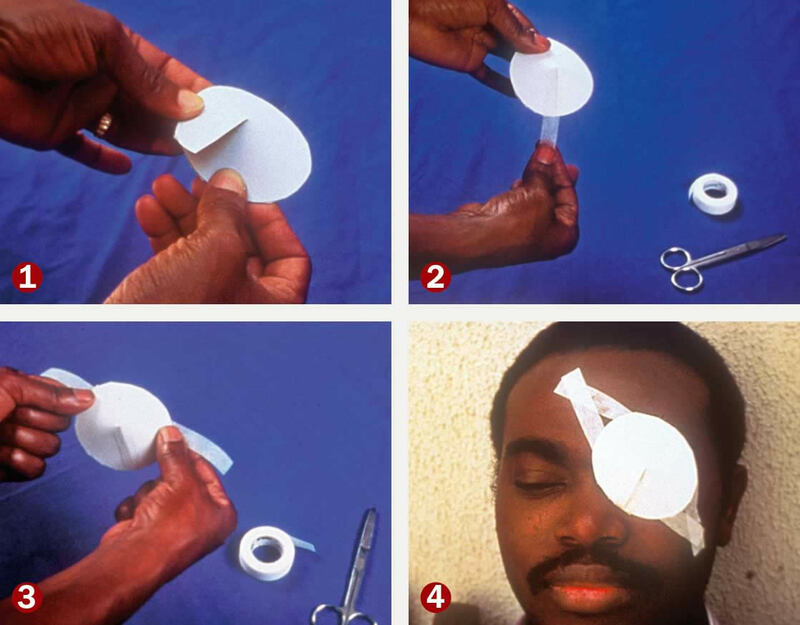 Making an eye shield is easy and inexpensive. It can be made from cardboard or firm paper. Health centres and health posts found in the villages readily have this, for example, from medication boxes. Where available, used x-ray film can also be used. Our community outreach programme is in partnership with the community-based rehabilitation programme of the Cameroon Baptist Convention Health board, sponsored by Christoffel-Blindenmission (CBM). Their field workers and volunteers see and refer eye patients in the community. Every year, refresher courses are organised, where they are taught, amongst other things, how to make an eye shield.